What we will create is a virtual host under the name; “myproject”. Change this to reflect your project alias name. I’m using wampserver so to edit this apache configuration file, i left click on wamp tray icon and Apache -> httpd.conf. This opens the file in notepad. 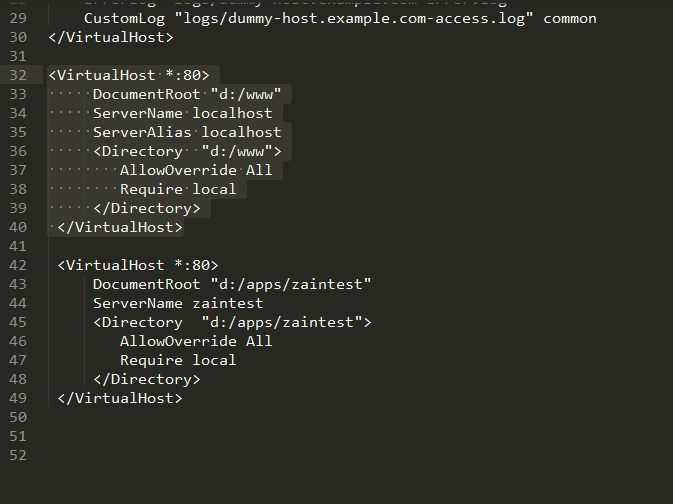 This enables virtual hosts on Apache. After you have done all the steps, restart wampserver for the configuration to be set. So cool. I’ve done this before but needed a refresher. Plain simple and to the point. Awesome! I can’t edit file “hosts”, Win10 tolds me, that I haven’t got authorization to edit and save something in ../drivers/etc/, but I am logged in Admin account. So, what can I do now? Another steps works fine. Thank you ! You need to open notepad (or other program) as admin (run as admin), this way you can save the changes inside the hosts file.